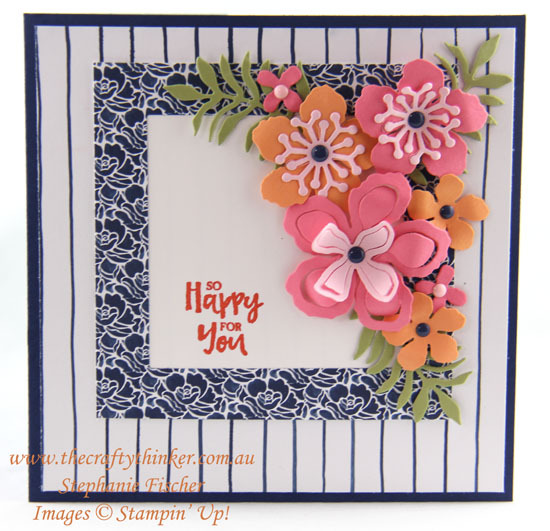 Welcome to the Crazy Crafters' Blog Hop with our Special Guest stamper, Valerie Moody - we are thrilled to have Valerie join us this month and so excited to CASE (Copy And Selectively Edit) any project that has been created by her . It was very difficult to make a decision because it turns out that I really love Valerie's work and found inspiration at every turn but this is Valerie's project I eventually chose to CASE, taking inspiration from the frame and flowers. Click on the image of her card to link to Valerie's blog. The Botanical Builder Framelits remain one of my very favourite die sets - they make it so easy to create something very pretty! So this is the card that I made. This was such a quick and simple card to make but I'm so happy with the result. I made it for a friend who is moving into a new home. The base card is a 51/2" square in Night of Navy. To that I added a layer of paper from the beautiful Floral Boutique pack and then used another sheet to create the frame with Layering Squares framelits. I cut a variety of flowers and foliage using the Botanical Builder framelits with Peekaboo Peach, Pink Pirouette, Flirty Flamingo and Pear Pizzazz cardstock. For the flower centres, I used Enamel Shapes in Night of Navy and Pink Pirouette. I placed a layer of Whisper White behind the frame and stamped the greeting on it with Tangerine Tango ink. 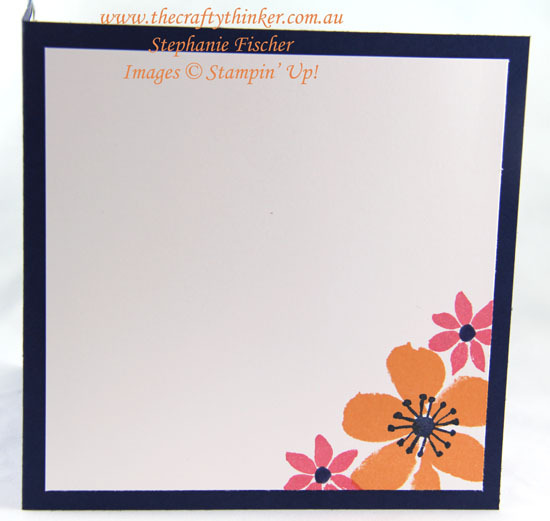 To decorate the inside corner of the card, I used the Blooms & Wishes stamp set with Peekaboo Peach and Flirty Flamingo inks. I added a flower centre to the larger flower with Night of Navy ink and used a Night of Navy marker to add centres to the other flowers by hand.